English topographical watercolourist and graphic artist. He and his brother Thomas (1721-1798) trained at the Military Drawing Office of the Tower of London and were engaged as draughtsmen on the survey of the Highlands of Scotland after the rebellion of 1745. Paul went to live with his brother at Windsor Park, where Thomas held the position of Deputy Ranger (they did many views of Windsor and its environment, and the Royal Library at Windsor Castle has an outstanding Standby collection). Their work is similar in many respects, but Paul was more versatile as well as a better artist, his work including lively figure subjects as well as an extensive range of landscape subjects. 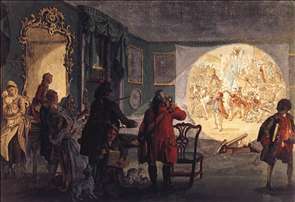 In his later work he often used body-colour (he also sometimes painted in oils) and he was the first professional artist in England to publish aquatints (1775). He was singled out by Gainsborough as the only contemporary English landscape artist who painted real views from nature instead of artificial Picturesque compositions. 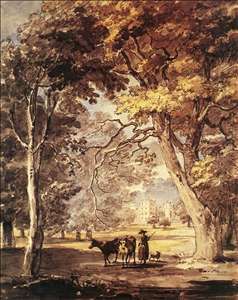 Sandby has rather unjustifiable called the father of watercolour art , but certainly his distinction won prestige for the medium. He was a founder member of the Royal Academy and his brother was its first Professor of Architecture. See more details about "Cow-Girl in the Windsor Great Park"
See more details about "The Laterna Magica"